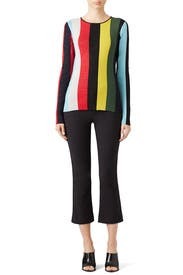 Standout in shimmering style in this bold color-blocked sweater by Diane von Furstenberg. 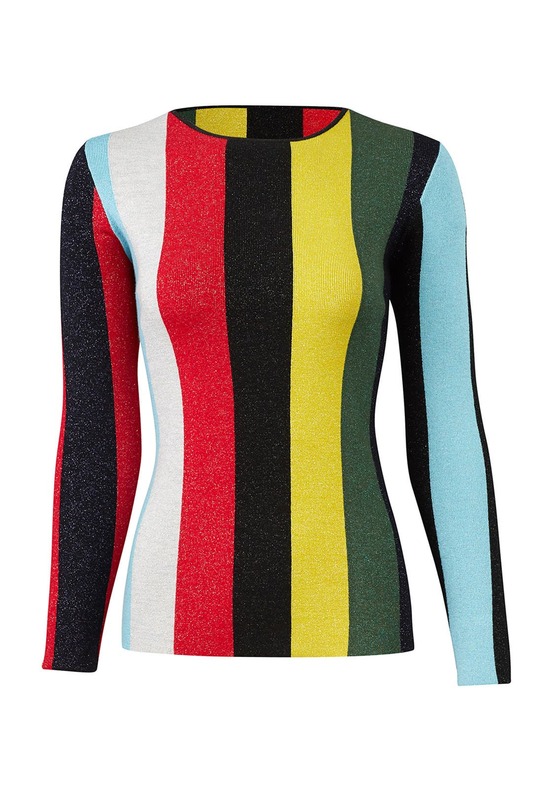 Multi printed knit (57% Merino Wool, 31% Viscose, 7% Polyester, 4% Nylon, 1% Spandex). Sweater. Long sleeves. Crew neckline. 24" from shoulder to hemline. Imported. Fits tight and no room for lumps or bumps. I should have sized up. Ah awkward fabric - sticky and uncomfortable. Too clingy to be professional. Far less flattering than I thought it would be. This sweater fits close hugging the body. The print is super fun and flattering. I love the glitter detail! I really liked this sweater. It was roomy enough for me to wear an undershirt beneath it, yet fited enough so it didn't look frumpy. The material was comfortable and not itchy as I had feared. I am long waisted, but I could raise my arms over my head and not expose my belly. This was a winner for me. I rented the sweater for a birthday trip. It is a lightweight sweater but clearly very good quality material. There's a nice amount of sparkle but not too much. I wore it with jeans but it could easily be dressed up. This was a super fun piece to wear to work with some black jeans. 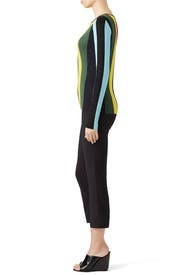 It is a nice thick material and is very flattering. As other reviewers have said, it is more glittery in person but in a good way! Will definitely rent again. Got loads of compliments. Elongating and easy way to dress up but still look relaxed. I wore this 3 times - bring your child to work day, a party I went to and a birthday party I hosted. Wish I'd had cooler weather! This is a beautiful top and fits great. It had just the right amounts by of stretch, and the shine was not too much. Unfortunately, soon after I received it we had a heat wave and it was too warm to wear again. I loved it but it was a little itchy. Great fit but I would wear a very light silk undershirt. This is super colorful with a bit of sparkle, but its best for smaller chests. It can be a lot with all the color, sparkle and stripes. I like it a lot, but not enough to wear it twice. No compliments either, so that's somewhat telling for an unusual top. With all DVF, size up. 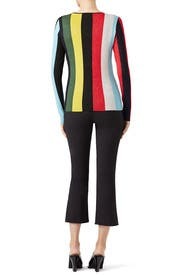 I'm usually a S or M and with DVF, I always get the M.
This is a great sweater. It can be dressed up or down. Work or play. Great fit, true to size. Comfortable with a great fit. This fit really well and was ... forgiving. My just had a baby muffin top was nicely hidden. Got lots of compliments - it's appropriate for lots of occasions but it's so unique. Glad to have it in my rotation. A little too "glittery" for non-holiday wear. I got this as part of Unlimited and didn't wear. The material has a lot of glitter and it just didn't seem appropriate for non-holiday wear. Reminded me of a vintage piece. Cute, but not what I wanted to wear. DVF for the win AGAIN! I love DVF dresses and EVERY SINGLE ITEM that I see from her! 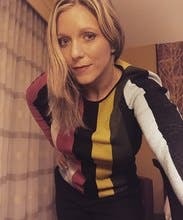 This was no different, received many comments on this top as I have when wearing her wrap dresses. Absolutely loved it! Fit great. Skins body nicely with good amount of stretch. Sleeves are long compared to the body of the shirt- which is great for me bc I have long arms. Sweater is a heavy material but quite comfortable for a glitter sweater. Weird fit with no shape. Felt like a circus clown. Metallic threads throughout the stripes make it unique. Has a retro vibe with great colors. Fit true to size and always got compliments. 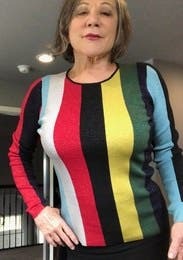 A great sweater. This was a perfect fit for me. 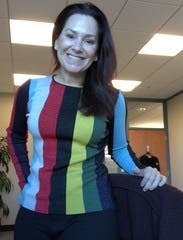 I ended up not wearing it because the pattern was not that flattering for me. Still, a beautifully made piece with great colors.